Oil Painting Medic: What do I do with the Backgrounds to my Still Life Paintings? What do I do with the Backgrounds to my Still Life Paintings? After spending hours arranging a still life setting, the artist may suddenly be struck by the emptiness of the background. This element might be left until last, when the artist has run out of steam, leading to the blocking in of one colour, often brown, grey or white. In an attempt to make the background more interesting, a shadow might be introduced behind the objects, which is likely to appear unconvincing if painted from memory. How can the artist create interesting backgrounds for a still life painting? Not thinking through the colour chosen for the background, which might be garish, too heavy or wish-washy. A purple or red background for instance, might appear to advance at the viewer if pale objects are featured, causing a chromatic imbalance. Again, using anemic pales for the background is likely to make the painting appear incomplete. Similarly a background that does not give adequate visual information about where the object lie in space is likely to result in a painting of objects that appears to float on the page. An idealized background that simply gets darker or paler towards the edge of the painting might also leave the impression that the artist simply ran out of ideas of what to do with the background. Simply painting the background as it is, including objects falling off the edge of the painting could cause a compositional imbalance. Not applying artistic editing could also lead to a cluttered background that takes the focus from the objects. Firstly observe the shape of the background. This is known as negative space and can be used to balance a composition. Look for imbalances between the objects and the background. Are there too many tall objects on one side of the setting creating a wedge shape to the background? Try mixing up the shapes of the objects, so that there are no gaping chasms of empty space within the composition that could take the balance from the painting. An empty background will look less obtrusive if divided into simple elements. This might be the edge of a lace curtain behind the objects, part of a shadow falling over the table or sunlit squares filtering over the wall. Dividing the background up in this way provides visual channels through which the eye may travel to select focal points in the painting. These outlines could be used to echo another contour within the composition such as a piece of crockery. Avoid placing such an element dead centre of the composition or it may look contrived. A simple background of one colour can in fact be effective if applied with thought. Mere brush marks will give a still life study a feeling of movement and energy. Using two colours will create an interesting interplay of patterns and marks through expressive brush strokes. Consider using a contrasting colour to the main objects, to give the still life painting added punch. Using a smoky blue background for orange and red fruit will create a dazzling effect. To the eye, shadows are as solid as the objects themselves and can be used to fill an empty background. A desk-lamp or candle can be moved about and the shadows shifted at will. Shadows may appear to stretch out across the wall under oblique lighting, or provide weird and abstract forms. 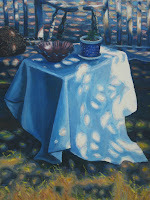 Remember that shadows can harbor shifts in tone and hue, as well as different outlines which can be exploited. Placing objects at a kitchen window or mirror will offer a view with a view. A tantalising glimpse of the garden beyond the aperture of curtains could add depth and other-worldiness to the composition. If the objects are brightly-lit, reflections might be seen on the window pane and which could add a focal point to the background. Supply contrast to the objects, whether this is textural, chromatic or tonal. A yellow flint of sunlight behind slate silverware provides contrast in colour temperature; pale minimalist wallpaper provides tonal contrast against a brown brandy bottle; a heavy, embroidered curtain provides textural contrast against smooth glassware. Placing large objects within the composition can be used to break up the background into more manageable parts. A large glass tumbler provides a great opportunity to show a distorted view of the background which may take up a significant part of the painting; the slats of a lathback chair breaks up the background into smaller compartments and creates interesting negative shapes. Or simply a bulky pair of work-boots provides a diversity of outlines that obscure large parts of an empty background. A bland background can spoil an otherwise well-painted still life. The secret is to treat the background with equal importance to the objects themselves. Look out for an imbalance in distribution of this “negative space” throughout the painting. Mix up the objects in a bid to find a more interesting background shape. Expressive brushmarks will inject energy into a still life painting or contrast can be injected by colour, texture or tone. A simple adjustment can make the background a more interesting element with equal significance to the still life objects.